In a musical or music-heavy genre of theatre the music director is the person who makes artistic decision and controls the artistic side of the musical output. They will often conduct (or band-lead) and generally acts as the main point of contact for all musicians during the performance. This person shapes the overall contours of the music and is responsible both for achieving the desired sound and maintaining standards in performance. This is similar to the music director, but has a slightly more administrative role. These are often used with compilation and pre-recorded scores, as their main job is to select appropriate music, suitable composers, and decide (often in collaboration) where cues should occur within the score. This is still a creative role within the music department, even if there is less of a focus on live musicians. A mostly managerial and logistical role, the music manager performs the important function of coordinating all musicians, equipment, scores, rights and composers/songwriters. They can also be the fixer (the person who recruits and engages musicians) or the orchestra manager (the band equivalent of the stage manager who works with the orchestra during a run of performances). Composing involves the planning and writing of the music for the performance, but does not include the performance or recording of the music. The composer will often be present at rehearsal or recording to ensure that the music works, but is not necessarily a performer. 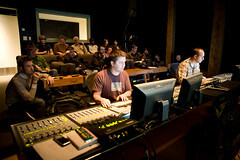 Sound designers decide how sound will be used in the production, and the role can vary from the construction of soundscapes and effects to the planning of live sound rigs and acoustic design. Once the music is in rehearsals the performers (particularly on-stage actors and singers) are supported by a repetiteur, an accompanist, or other members of the music staff. Their main job is to familiarise and coach the performers with the music for the production, to ensure that they are prepared for the introduction of the band or orchestra. These are the people who perform the music on the night. They may be instrumentalists or singers or electronic musicians, and may even be members of the above areas also. These are the people who interpret the planned musical input (the score, the sounds, the songs) and replicate and present it each performance for the audience. They may also perform in a recording session so that the recording can be used for rehearsal or the performance itself (although this is frownedupon by musicians unions and performers). I hope this sheds some light on the various roles and positions within the music department for a production. If you have corrections or suggestions leave them in the comments.